Legacy Christian Academy graduated senior James Brad (right with LCA Principal Greg Scheck) received a Southwest District student-athlete scholarship June 19 at an OHSAA Southwest District awards ceremony in Dayton. Carroll’s Justin Dirksen also was a scholarship recipient. The Southwest District Board held its 25th Annual Scholar-Athlete Reception, June 19, at the Dayton Marriott, and two Greene County area students were among the event’s recipients. James Brads of Legacy Christian Academy, and Justin Dirksen of Carroll, were among the Southwest District scholarship recipients. Brads competed in boys cross country, boys basketball and boys track & field, while Dirksen is listed as a member of the Patriots’ boys soccer squad and boys basketball team. 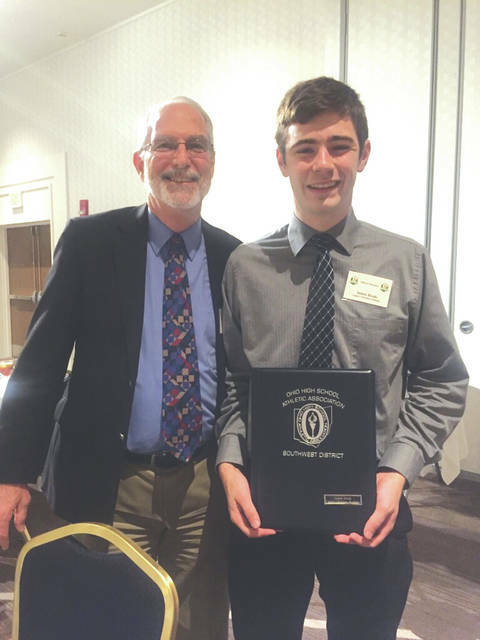 Since 1993, the Ohio High School Athletic Association has awarded scholarships to some of southwestern Ohio’s top senior scholar-athletes. Forty-six students were presented with monetary awards and recognition totalling over $36,000. Special scholarships (honorary and memorial) were also presented from the Southwest District Board honoring past district board members with 12 or more years of service to the district. https://www.xeniagazette.com/wp-content/uploads/sites/32/2018/06/web1_JamesBradsGregScheck_PS.jpgLegacy Christian Academy graduated senior James Brad (right with LCA Principal Greg Scheck) received a Southwest District student-athlete scholarship June 19 at an OHSAA Southwest District awards ceremony in Dayton. Carroll’s Justin Dirksen also was a scholarship recipient. Submitted photo. Contact John Bombatch at 937-372-4444, Ext. 2123. We hope to have a photo of Justin Dirksen for Friday’s newspapers.